The eruptive styles of Hawaiian volcanoes change as they evolve. During the shield building stage, large volumes of fluid, tholeiitic lava erupt and build broad, shield-shaped mountains. Fire fountains, surface flows of pahoehoe and ‘a’a lava, and flows within lava tubes are typical of the eruptions. An example is Mauna Loa on the Big Island. As the volcano ages and moves away from the hot spot, the magma fractionates and eruptions of the post-shield stage contain more alkalic lavas. The summits become peppered with smaller cinder and spatter cones. An example is Haleakala on Maui. The final eruptive phase is the rejuvenated phase. The lavas are strongly alkalic and the eruptions are often violent and build more steep-sided cones of layered ash and pyroclastic debris. Examples are Diamond Head (see photo on the Volcanic Hazards page) and Hanauma Bay on Oahu. Discoveries of submarine lava ponds and flood basalts, such as produced on the North Arch, imply that lava may stay molten for a long time, despite the almost infinite heat sink of the ocean. 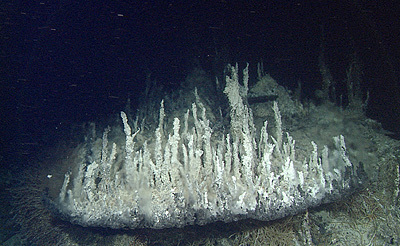 Fragmental rocks (ash, hyaloclastites, and volcaniclastic rocks), limu o Pele, and spatter imply that explosive eruptions take place even in the deep sea, where hydrostatic pressure is so great that steam bubbles should not be able to expand. These observations indicate volcanic processes that contradict conventional wisdom. Hot spot volcanoes often have long rift zones that radiate from a summit caldera, along which smaller vents and fissures occur. Pu’u O’o, which has been erupting for more than 20 years, is a vent along Kilauea’s east rift zone. The minerals found in the erupted lavas offer clues about processes within the rift zones of the volcanoes. LOIHI – The early development and growth of oceanic volcanoes that eventually grow to become ocean islands are poorly known. In Hawai‘i, the submarine Lo¯ ‘ihi Seamount provides the opportunity to determine the structure and growth of such a nascent oceanic island. 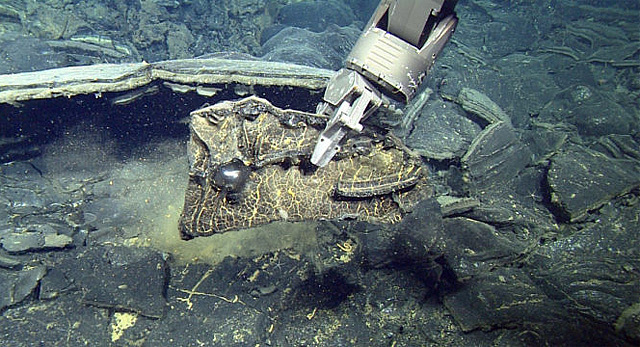 High-resolution bathymetric data were collected using AUV Sentry at the summit and at two hydrothermal vent fields on the deep south rift of Lo¯ ‘ihi Seamount. The summit records a nested series of caldera and pit crater collapse events, uplift of one resurgent block, and eruptions that formed at least five low lava shields that shaped the summit. The earliest and largest caldera, formed 5900 years ago, bounds almost the entire summit plateau. The resurgent block was uplifted slightly more than 100 m and has a tilted surface with a dip of about 6.5 toward the SE. The resurgent block was then modified by collapse of a pit crater centered in the block that formed West Pit. The shallowest point on Lo¯ ‘ihi’s summit is 986 m deep and is located on the northwest edge of the resurgent block. Several collapse events culminated in formation of East Pit, and the final collapse formed Pele’s Pit in 1996. The nine mapped collapse and resurgent structures indicate the presence of a shallow crustal magma chamber, ranging from depths of 1 km to perhaps 2.5 km below the summit, and demonstrate that shallow sub-caldera magma reservoirs exist during the late pre-shield stage. On the deep south rift zone are young medium- to high-flux lava flows that likely erupted in 1996 and drained the shallow crustal magma chamber to trigger the collapse that formed Pele’s Pit. These low hummocky and channelized flows had molten cores and now host the FeMO hydrothermal field. The Shinkai Deep hydrothermal site is located among steep-sided hummocky flows that formed during low-flux eruptions. The Shinkai Ridge is most likely a coherent landslide block that originated on the east flank of Lo¯ ‘ihi. Reference: Clague, D.A., Paduan, J.B., Caress, D.W., Moyer, C.L., Glazer, B.T., & Yoerger, D.R. (2019). Structure of Loihi Seamount, Hawaii and lava flow morphology from high-resolution mapping. Frontiers in Earth Science, 7, doi: 10.3389/feart.2019.00058. OAHU – The Sugarloaf flow is a melilite nephelinite erupted from the Tantalus rift during rejuvenated-stage volcanism on O‘ahu, the Honolulu Volcanics. The flow ponded in Mānoa Valley forming a ∼15 m thick flow which was cored and sampled in a quarry. Nepheline from a pegmatoid segregation in the flow yielded a 40Ar–39Ar age of 76 ka. This age, combined with others, indicates that the Tantalus rift eruptions are some of the youngest on O‘ahu. Honolulu Volcanics erupt on average about every 35–40 ka indicating that future eruptions are possible. We evaluated the compositional variability of 19 samples from the flow, including 14 from the core. Twelve samples are representative of the bulk flow, four are dark- or light-colored variants, one is a heavy rare earth element (REE)-enriched pegmatoid, and two visually resemble the bulk flow, but have chemical characteristics of the dark and light variants. Our objective was to determine intraflow heterogeneity in mineralogy and composition. Variable abundances of Na2O, K2O, Sr, Ba, Rb, Pb and U in the flow were caused by post-eruptive mobility in a vapor phase, most likely during or soon after flow emplacement, and heterogeneous deposition of secondary calcite and zeolites. Relative to fine-grained samples, a pegmatoid vein that crosscuts the flow is enriched in incompatible trace elements except Sr and TiO2. Element mobility after eruption introduced scatter in trace element ratios including light-REE/heavy-REE, and all ratios involving mobile elements K, Rb, Ba, Sr, Pb, and U. Lavas from some of the 37 Honolulu Volcanics vents have crosscutting REE patterns in a primitive mantle-normalized plot. Such patterns have been interpreted to reflect variable amounts of residual garnet during partial melting. Previous studies of lavas from different vents concluded that garnet, phlogopite, amphibole, and Fe–Ti oxides were residual phases of the partial melting processes that created the Honolulu Volcanics (Clague and Frey, 1982; Yang et al., 2003). However post-eruptive processes in the Sugarloaf flow also produced crossing REE patterns. Eruptions on the Tantalus rift, including the Sugarloaf flow, produced volatile- and crystal-rich ash with interstitial glass and melt inclusions in olivine containing 4.2–6.4 wt% MgO compared to the flow average of 11.8 wt%. This flow erupted as a partially crystallized viscous magma at least 100 °C below its liquidus. The slow advance and cooling of the 15-m thick ‘a’ ā low promoted the segregation of pegmatoids, formation of light and dark bands with differing proportions of melilite and clinopyroxene, and induced volatile-enhanced mobility of incompatible elements. OAHU – Ka’ena and Wai’alu Ridges form prominent submarine ridges NW of the island of O’ahu, Hawai’i. We evaluate whether or not either one of these ridges represents a submarine extension of Wai’anae Volcano on O’ahu using new bottom observations, geophysical surveys, and geochemical data acquired on new samples from the region. Wai’alu Ridge has the morphology of a submarine rift zone but is too shallow for its distance from the O’ahu shoreline; Ka’ena Ridge also is unusually shallow and is surmounted by two topographic shields. Ka’ena and Wai’alu Ridges have similar magmatic and volcanic evolutionary histories, beginning ca. 5 Ma with a submarine, shield phase of volcanism that produced high-SiO2, low- FeO* tholeiites with higher 208Pb/204Pb than in the adjacent Wai’anae Volcano. Late-shield volcanism included transitional and alkalic rock types, with lower SiO2 and enrichment in incompatible elements, especially P2O5, Nb, Zr, Ti, and light rare earth elements. The transition from shield to late-shield stage occurred as the edifice was beginning to emerge from the sea. Geological observations and K/Ar ages indicate that Ka’ena emerged above sea level ca. 3.5 Ma, reaching a maximum height of ~4000 m above the abyssal ocean floor and 1000 m above sea level. Relatively weak gravity anomalies, topographic lineaments, and the orientation of dike complexes indicate a volcanic structure that is independent of Wai’anae Volcano. Thus, volcanic structure, geochemistry, and age all indicate a precursor volcano to the island of O’ahu, which we call Ka’ena Volcano. After emergence, Ka’ena Volcano tilted ~2° to the south. We estimate a total volume of 20–27 × 103 km3 for Ka’ena Volcano, taking into account overlapping geometry of concurrently active volcanoes. Sample compositions from the Ka’ena landslide deposit are entirely consistent with derivation from Ka’ena, whereas most samples from the Wai’anae slump are likely derived from Wai’anae Volcano. Uniformly oriented dikes in the Wai’anae NW rift zone likely reflect buttressing by a preexisting Ka’ena Volcano. Unusual isotopic compositions of some Wai’anae samples, including unique hydrous silicic lavas, probably reflect interaction with underlying Ka’ena crust. A newly recognized lava flow field on the southern flank of Ka’ena Ridge extends the previously known distribution of secondary volcanism in the Kaua’i Channel. Putative submarine volcanic activity in the region in 1956 cannot have built a large edifice and is unlikely to have produced pumice that was found on O’ahu shores. This eruptive activity therefore remains unconfirmed. Reference: Sinton, J.M., D.E. Easton, M. Tardona, D. Pyle, I. van der Zander, H. Guillou, D.A. Clague, J.J. Mahoney (2014) Ka’ena Volcano – A precursor volcano of the island of O’ahu, Hawai’i. Geol. Soc. Am. Bull., 126 (9-10): 1219–1244. doi: 10.1130/B30936.1. MAHUKONA VOLCANO – Age spectra from 40Ar/39Ar incremental heating experiments yield ages of 298+25 ka and 310+31 ka for transitional composition lavas from two cones on submarine Mahukona Volcano, Hawaii. These ages are younger than the inferred end of the tholeiitic shield stage and indicate that the volcano had entered the postshield alkalic stage before going extinct. Previously reported elevated helium isotopic ratios of lavas from one of these cones were incorrectly interpreted to indicate eruption during a preshield alkalic stage. Consequently, high helium isotopic ratios are a poor indicator of eruptive stage, as they occur in preshield, shield, and postshield stage lavas. Loihi Seamount and Kilauea are the only known Hawaiian volcanoes where the volume of preshield alkalic stage lavas can be estimated. Reference: Clague, D.A., Calvert, A.T. (2009) Postshield stage transitional volcanism on Mahukona Volcano, Hawaii, Bulletin of Volcanology, 71: 533–539. doi: 10.1007/s00445-008-0240-z. OAHU – Lavas and volcaniclastic deposits were observed and collected from 4 submarine cones that are part of the rejuvenated stage Honolulu Volcanics on Oahu, Hawaii. The locations of these and a few additional, but unsampled, vents demonstrate that nearly all the vents are located on or very close to the shoreline of Oahu, with the most distal vent just 12 km offshore. The clastic samples and outcrops range from coarse breccias to cross-bedded ash deposits and show that explosive volcanism at depths between about 350 and 590 m depth played a part in forming these volcanic cones. The eruptive styles appear to be dominantly effusive to strombolian at greater depths, but apparently include violent phreatomagmatic explosive activity at the shallower sites along the submarine southwest extension of the Koko Rift. The compositions of the recovered samples are broadly similar to the strongly alkalic subaerial Honolulu Volcanics lavas, but the submarine lavas, erupted further from the Koolau caldera, have slightly more radiogenic Sr isotopic ratios, and trace element patterns that are distinct from either the subaerial Honolulu Volcanics or the submarine North Arch lavas. These patterns are characterized by moderate to strong positive Sr and P anomalies, and moderate to strong negative Cs, Rb, U, Th, Zr, and Hf anomalies. Most samples have strong negative K and moderate negative Ti anomalies, as do all subaerial Honolulu Volcanics and North Arch samples, but one group of samples from the Koko Rift lack this chemical signature. The data are consistent with more garnet in the source region for the off-shore samples than for either the on-shore Honolulu Volcanics lavas. New Ar–Ar ages show that eruptions at the submarine vents and Diamond Head occurred between about 0.5 Ma and 0.1 Ma, with the youngest ages from the Koko Rift. These ages are in general agreement with most published ages for the formation and suggest that some much younger ages reported previously from the Koko Rift are probably erroneously young. HAWAII, MAUI, NI’IHAU – High-resolution bathymetric maps show that submarine flat-topped volcanic cones are common on the submarine rift zones of Kilauea, Kohala, Mahukona, and Haleakala volcanoes. Samples show these cones are tholeiitic basalt erupted during the shield-building stage. Similarly shaped flat-topped cones off of Ni’ihau are alkalic basalt erupted during the rejuvenated stage. 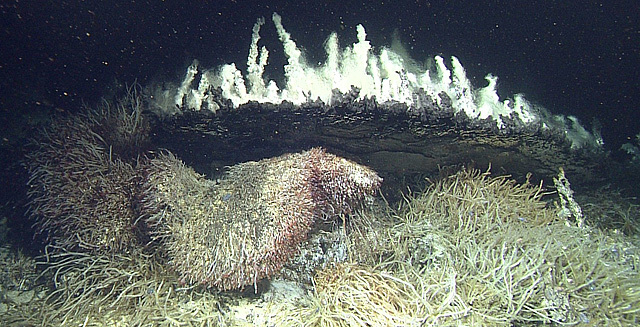 These flat-topped cones appear to have formed during effusive eruptions lasting years to decades, and apparently form as continuously overflowing submarine lava ponds. There is a delicate balance between lava supply and cooling of the floating crust to sustain these ponds. Pointed cones of alkalic basalt and hawaiite erupted during the post-shield stage are found on Hilo Ridge, Mahukona, Hana Ridge, and Ni’ihau. Lava that is volatile-rich or erupted in shallow water will produce fragmental and highly vesicular lava that will accumulate to form these steep, pointed cones. Reference: D.A. Clague, J.G. Moore, and J.R. Reynolds (2000) Formation of submarine flat-topped volcanic cones in Hawaii. Bulletin of Volcanology, 62: 214-233. doi: 10.1007/s004450000088.